China may give Rosneft a loan for a proposed increase in oil supplies, Arkady Dvorkovich, deputy prime minister said without specifying the amount. “A loan is not ruled out [to be given by the Chinese side for Rosneft’s increased oil supplies]. 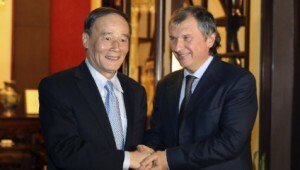 Rosneft discussed this issue with a corresponding Chinese bank,” Dvorkovich said. Russia is one of the world’s biggest oil exporters and China is the world’s biggest energy consumer. In compliance with a 2009 intergovernmental agreement, Rosneft and Transneft supply China with 15 million tons of oil annually – a deal that valid for 20 years. Russian companies have received loans from the China Development Bank, in exchange for long-term oil supplies to China. Transneft was earlier granted $10 billion and Rosneft granted $15 billion. Earlier this week Dvorkovich said Rosneft might increase crude supplies to China by over 9 million tons, required to support a crucial refinery project in Tianjin. “So far, specific parameters have not been defined, but in any case deliveries should be sufficient to implement the Tianjin refinery project,” Dvorkovich said. He also specified that elaboration of contractual obligations might take several months since it requires detailed work of lawyers and financiers. “We believe base conditions will be defined within several weeks,” Dvorkovich said. Last week Rosneft’s President Igor Sechin visited China and reached agreements on the increase of Russian oil supplies to China. “Next several months will be devoted to achieving contractual agreements, and we believe it will allow to increase crude supplies to China benefiting Russia, and within joint oil refinery project in Tianjin,” Dvorkovich said. Earlier this month there were reports that Rosneft planned a $25-30 billion oil-for-loans deal with China. However, this information was denied by the company’s press service and in a telephone conversation, Rosneft’s press service told The BRICS Post that there were no negotiations about the loan, even though Rosneft’s president was due to visit China.